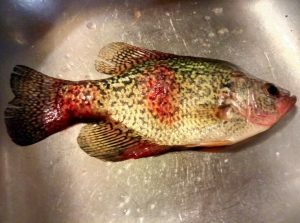 Many anglers in the Polk County area are familiar with a black crappie disease named black crappie sarcoma that exhibits red sores. The Wisconsin DNR has performed only a limited investigation of this disease. Students at UW Stout are pursuing further study. Kyla Boyd, a student at UW Stout with ties to Bone Lake, is leading this project and put together a press release. Please consider downloading, printing, and circulating that explanation and request for funding help to individuals and lake organizations in the area.